n the summer months, everyone wants to spend more time outdoors — and our canine companions are no exception. Unfortunately, while people typically know when to head indoors to cool off, dogs sometimes push themselves a bit too far when they’re having fun in the sun — and that’s when you may encounter heat stroke in dogs. According to Steven Berkowitz, DVM, an emergency/critical care veterinarian for NorthStar VETS in New Jersey, the most common symptoms of heat stroke in dogs (otherwise known as hyperthermia) are excessive panting, dark pink to red mucus membranes and gums, an inability to continue with normal exercise, nausea or vomiting, and weakness or passing out. 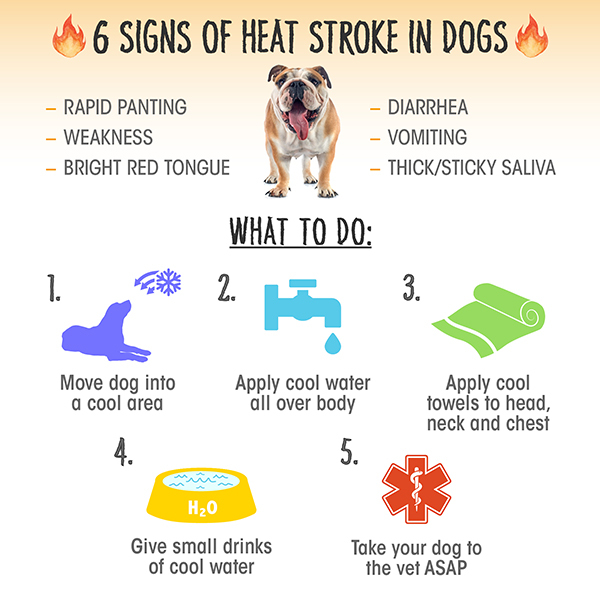 Some less-obvious signs of heat stroke in dogs include an increase in heart rate, muscle cramping, a loss of moisture on the dog’s gums or tongue and erythema (a reddening of their skin). Heidi Houchen, DVM, an emergency/critical care veterinarian for VCA Northwest Veterinary Specialists in Oregon, adds that as the bodies of overheated dogs try to cool themselves, their blood vessels dilate, blood pressure drops and internal organs become increasingly damaged. 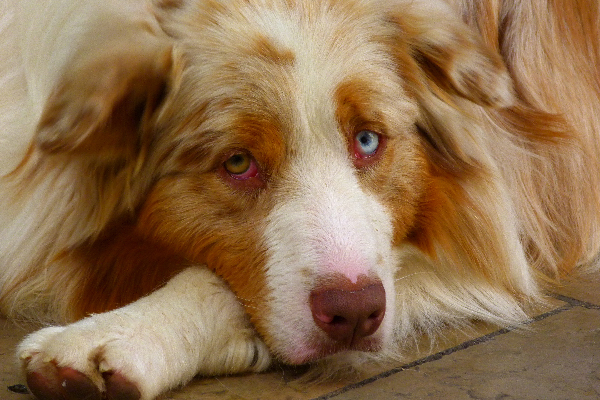 “Depending on the situation, overheated dogs easily and quickly can develop shock, seizures, coma and ultimately die within a matter of minutes,” Dr. Houchen warns. The best prevention for heat stroke in dogs is a pet owner who pays close attention to the weather — and knows her dog. “Pet owners are the first and best line of defense for prevention, early recognition and initial treatment of heat stroke,” Dr. Houchen asserts. If at all possible, she advises keeping your furry friends inside on the warmest or sunniest days. Just make sure your home is consistently kept at a temperature that’s comfortable for both its canine and human inhabitants. Is Fido your go-to fitness buddy? You’ll also need to have a good understanding of your pet’s personal fitness level — and a willingness to change or shorten your workouts in the name of avoiding heat stroke in dogs. “Do not cycle or jog with your dog if there’s any question as to [your dog’s] physical fitness or the heat,” says Dr. Houchen, who notes that heat stroke in dogs (and related conditions) is prevalent in pets with short faces (brachycephalic dogs like Bulldogs or Pugs). If you plan on taking any road trips with your four-legged friend this summer, never leave your dog unattended in a car for any length of time. “The best rule to follow is never to let your pet ride with you if there’s any other stop besides the final destination,” Dr. Houchen explains. If your pet is showing any symptoms of heat exhaustion, give your dog plenty of water — and make sure she drinks it. You can also wet your dog with room temperature water. Dr. Berkowitz advises skipping ice water or ice packs, because they can actually make your pet’s core temperature rise. And, don’t saturate your dog in water because it prevents effective evaporation of the heat. “If your dog is not relaxing and starting to act more like your lovable buddy, immediately bring him or her to the closest animal hospital for treatment,” Dr. Berkowitz advises. Pet parents should also keep in mind that heat stroke in dogs can happen even on cloudy or cooler days. “You don’t have to live in a southern climate — and it doesn’t have to be August — for heat stroke to occur. In our emergency room, we’ve seen dogs come in with heat stroke on a spring day when the temperature was in the 60s … and in the summer months, owners with young, active, in-shape dogs get into trouble as their ‘live-to-please’ dogs will keep going long after they start having problems with overheating,” Dr. Houchen says.